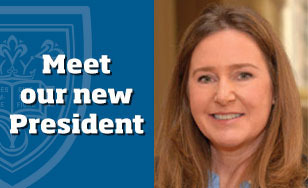 Colette McCarrick Geary took office on July 1 as the 12th president of the College. The entire College community offers warm greetings of Benedictine hospitality! Dr. Geary comes to us from The College of New Rochelle in New Rochelle, NY. She served as Senior Vice President for Strategic Initiatives there starting in 2014, leading the implementation of a strategic plan across six campuses and four schools. She also oversaw the Office of Mission and Ministry, which promotes mission-based commitments in the life of the college, key elements of which include an emphasis on the value of the liberal arts; a special commitment to the education of women; expanding educational access to populations historically underserved by higher education; and an emphasis on life-long learning. Geary said she is excited about her new role. "Thank you for your confidence and for all your positive energy," she said. "I am eager to put my experience, values and skills in service of this remarkable college." An inauguration ceremony for Dr. Geary will be held on Friday, Oct. 14.